Heat oven to 400° F. Grease large cookie sheet. Cut dough in half; place on greased cookie sheet. Press each dough piece into 6-inch round. Bake 10 to 12 minutes or until crust begins to brown. Spread each crust with spinach dip. 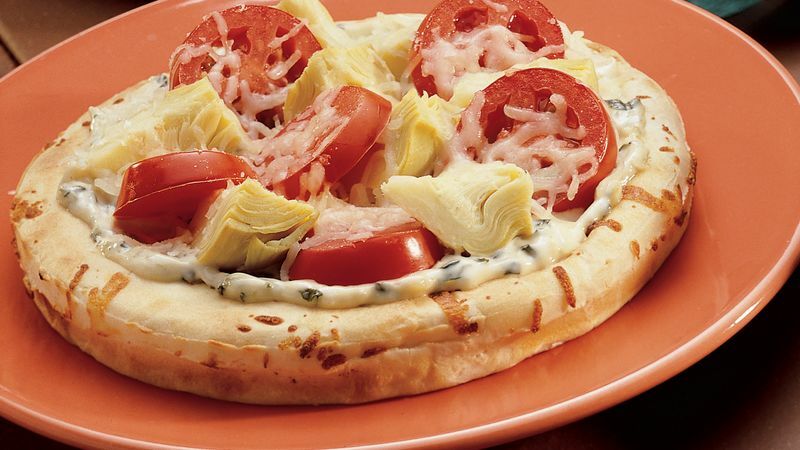 Top with artichoke hearts and tomatoes; sprinkle with cheese. Bake an additional 8 to 10 minutes or until cheese is melted and crust is golden brown. For this pizza, artichoke hearts that are smaller will be more tender. They will be identified as “small” on the label.